Sylvia had recently moved from the family farm into a local village house complete with 2 decrepit and failing corrugated tin sheds (18m and 12m long) which were mostly held up by the rubbish inside them. Unable to see beyond the mess in front of her she met up with Rob to see if he could come up with creative ideas at a budget price for their replacement. Although happy to be in a warm and comfortable town house, Sylvia missed the farm and liked Rob’s suggestion of designing and building barn style outhouses which could serve multiple functions – somewhere for the dogs to sleep, garaging for the cars, garden storage and potting shed, plus log store. A pillar of the local community, somewhere for her to hold Church fundraising events as well would be a bonus! The final design kept to the original footprint and roofline, and was manufactured entirely from douglas fir felled on the Stanage estate, less than 5 miles from Sylvia’s property. 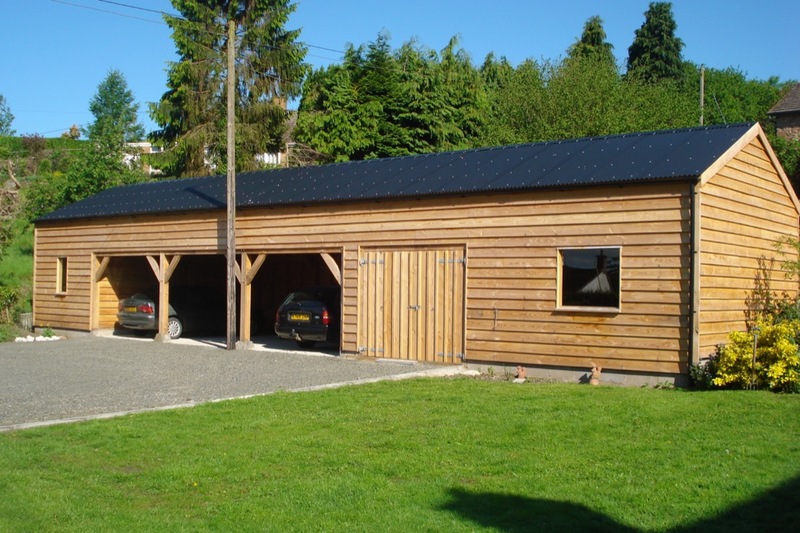 All the cladding, barge boards and barn doors were milled and manufactured from the same douglas fir. Old style black corrugated tin for the roof was a tip of the hat to the old sheds and served to keep the costs down. Once Sylvia had arranged for the old sheds to be demolished and removed, Rob coordinated the project from the groundworks up. Sylvia was delighted with the results and commissioned a cosy garden shelter for the purposes of surveying her beautiful barns whatever the weather.